"Is my syllabus accessible to all students who might use it?" "Am I following critical best practices? Am I doing it correctly?" "What is the possible impact of not creating an accessible syllabus?" "Does creating an accessible syllabus apply to me?" Learn the answers to all of these questions—and more. This short training is designed to help every Instructor to gain the knowledge and skills needed for success to create an accessible syllabus using Microsoft Word. This online course is free to everyone and available for enrollment in IU Expand. The course contains a series of short lessons on guidelines and specific skills. Features also include examples, demonstration videos, practice quizzes, and hands-on exercises. You can optionally complete an ungraded pre-course knowledge check, as well as a Final Exam at the end of the course. 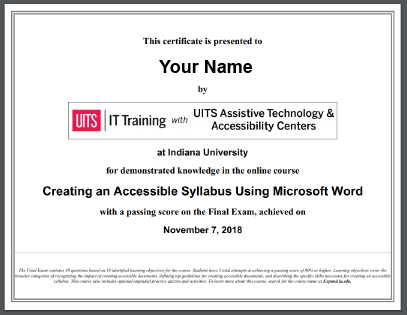 Through a great collaboration of several technology service owners at IU, many of the lessons in this course directly embed the articles in the "Accessibility at IU help menu" article on the IU Knowledge Base—especially in the "Make digital resources accessible" and "Word files" sections. Course content was also developed in partnership with UITS Assistive Technology & Accessibility Centers. The Final Exam for this course is designed to be an accurate reflection of your knowledge upon completion of the course, based on all of the course learning objectives. Passing the Final Exam with a score of 80% or higher generates a PDF certificate automatically. You can use this certificate to demonstrate your understanding of these topics and skills with your peers and leadership, or as a personal mark of achievement for yourself.